The index opened huge gap-up above 8500 and stayed positive throughout the entire session with short covering in the second half to close at 8521.05, gain of 53.15 points. The broader market though was negative with 735 advances to 882 declines. Range for the series stays at 8200-8700. 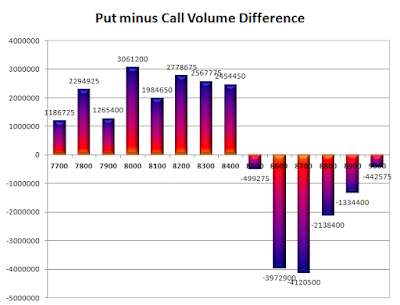 Call option 8600-9000 added 21.74 lacs OI with short covering at 8500 and below strike prices. Put option 8500-8300 added huge 29.86 lacs OI with profit booking at 8200 and below strike prices. Nifty Open Interest is at 2,12,56,800 up by 13,13,100, with increase in price, probably long build-up. 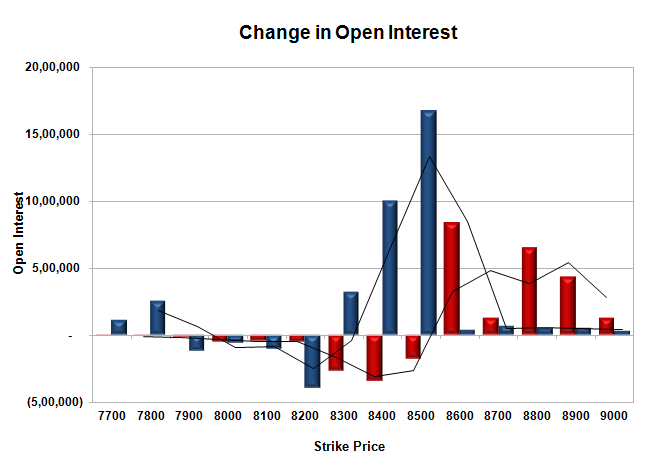 Bank Nifty Open Interest is at 22,25,040 up by 1,42,080, with increase in price, probably long build-up. 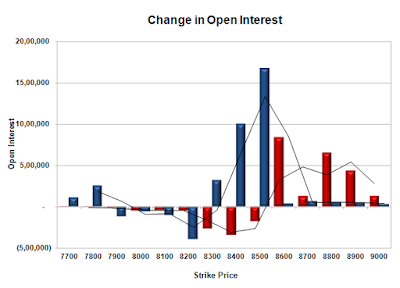 FII’s bought 18028 contracts of Index Futures, which includes net 17291 contracts long build-up and 737 contracts short covering, with increase in net OI by 16554 contracts, includes 34056 longs to 16028 shorts for the day. FII’s Index future open contract as on date is 226250 Longs to 48748 Shorts, Net long 18028 contracts. 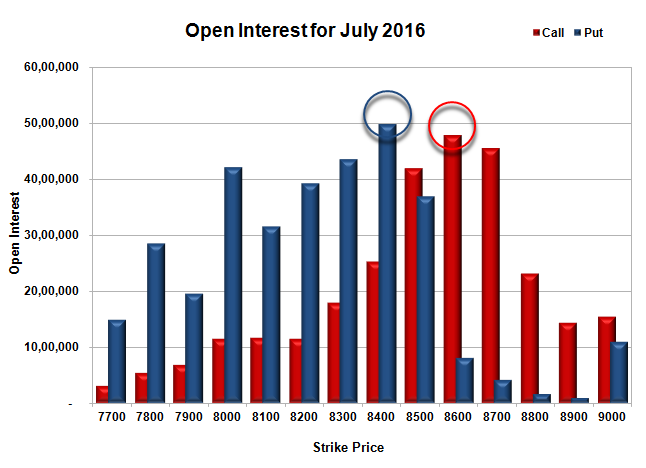 Initial support at 8500, with huge OI addition of 16.68 lacs and below that at 8400 with OI of 49.80 lacs. Initial and best resistance at 8600, with OI of 47.79 lacs and above that at 8700 with OI of 45.44 lacs. Day Range as per Option Table is 8443 - 8580 and as per VIX is 8455 - 8587 with 8509 as the Pivot.